I am currently teaching Grade 5 because that is the age of the Orca class. But I started teaching them when they were around 4 years old. Herme and Solo were part of that original homeschool group. Hilight joined around 4.5. Pink and Krit came in around 5 years old. Namhom joined the class around 6 years old. As a group, they have been learning together for about four to five years. They know each other well and work exceptionally well together as a team. Quick list of things I like: teaching, coming up with new ideas to use in the classroom, seeing teachers and students succeed at STIS, Deadpool, Arrested Development, American Chinese food, Mexican food, almost all kinds of music, Game of Thrones, Star Wars, Judge Dee novels (old Chinese detective stories), and living in Thailand. Hello! My name is Megan Diffey and I am the current grade 4 teacher! This is my second year at STIS. I grew up central Florida and then went to the University of Central Florida. I studied Psychology and received a TEFL certificate over my four years at UCF. I often volunteered at local elementary schools and taught ESOL classes with the Junior Achievement program as well as tutoring English language learners at the Center for Multilingual Studies at my university. I fell in love with teaching and ended up moving to Seoul, South Korea, soon after graduating. I taught a kindergarten class for a year as well as other primary school grades. It was a truly amazing experience that fueled me to find a job teaching in a more creative and challenging work environment. This quest brought me to Surat Thani International School. My time in Surat has been truly amazing. There is a great community of teachers and the town is in the perfect location to travel around Thailand. It is more traditional than other popular teaching destinations, which it makes it an immersive experience. The food here is excellent, and the Thai people are helpful and kind. STIS is an excellent place to work! There are small class sizes that let us have more creative freedom to do more interactive activities. The classes are fun, fast paced, and versatile which makes teaching exciting and challenges me to think of fun ways to teach the curriculum. I’ve enjoyed it so much I have signed on for a third year and I’m excited to continue living in Surat and teaching at STIS! Hello everyone, my name is Teacher Matthew! I’m from Boston, Massachusetts in the USA. I teach Grade 3 – The Pandas! I love science, learning new languages, scuba diving and traveling. I’ve been living in Thailand for one year and I’ve loved every moment of it. Before moving to Surat Thani, I lived northeast in Khon Kaen where I also taught English to Grade 3. In my free time, I do lots of reading and I love to play football. Before moving to Thailand, I taught English to adults while also working in finance. My philosophy as a teacher is to foster a positive, encouraging learning environment. That’s why my classes are fun and energetic while also being focused and intellectually stimulating. Math is my favorite subject to teach, but I’m also very passionate about English and science. I’m truly excited to be teaching the Pandas, and it’s an honor to be a part of your child’s growth into a lifelong learner. Hello, hello! My name is Phil Pingeton and I am the current grade 2 teacher. I come from Washington D.C. by way of Charlottesville, Virginia and the Republic of Macedonia. I have been working with and for kids in various ways for nearly ten years. I received my Master's Degree in Social Studies Teaching from the University of Virginia. My career has brought me to teach in high schools, rural elementary schools, school transportation, Peace Corps volunteering, youth outreach, and finally here at Surat Thani International School! I absolutely love it at this school and I felt at home as soon as I arrived. I am very excited to be a part of this school community and it is truly an honor being a part of your child's learning journey. All of these experiences have led to to promote creativity, curiosity, and caring for our community at all times in the classroom. In my spare time, I enjoy writing, reading, gardening, music, podcasts, comedy, and the great outdoors. I am also always looking for a good place to get a nice cup of coffee, so any recommendations are more than welcome. I hope you come by and visit sometime! My name is Keith and I’m the Director of Super English. I was originally born in Pittsburgh, PA, but attended University in Florida (Florida State University) where I studied Creative Writing. Before coming to Thailand, I got my teaching career started in Busan, South Korea. Afterwards, I came to Surat Thani, where I worked at our sister school Thidamaepra. I taught my same class from their Prathom three year through graduation last year in Prathom six and completed my CELTA course in the summer of 2014. I’m happy to be at STIS and working on a number of different projects, including curriculum development, classroom/teacher support, and additional duties where needed. I’ve enjoyed having extensive classroom time with the Starfish (pre-k), Kangaroos (K2), and Zebras (Grade 4). STIS has amazing students and seeing their continued growth has been special! Surat has been great for its ease of getting around, wonderful food/restaurants, and access to travel! I enjoy calling it home and it’s been a great place for me the past five years. In my spare time I enjoy exploring Surat and all parts of Thailand and sampling local cuisine. My name is Hannah Watkins and I am the Kindergarten 3 Rabbits class teacher at STIS! I am from the USA from the great state of Texas. I attended Louisiana State University and received a Bachelor’s Degree in Business Administration. During university, I worked as a gymnastics coach with children age 4-10. I moved to Surat Thani in April 2017 and taught English, Math, and Science to Grade 4 students at a Thai school in town. It was an incredible experience that helped prepare me to join the amazing team at STIS this year. I have loved every minute of my time in Thailand. I enjoy traveling to nearby beaches and waterfalls and hanging out with the other teachers in town. The teacher community in Surat is like a big family. I have felt welcomed and comfortable from the first week I arrived thanks to the amazing people in Surat Thani and at STIS! Hello, my name is Scott. I am currently a kindergarten teacher at STIS. I am originally from Louisiana and I attended McNeese State University where I earned a B.A. in History. I have years of experience in youth mentoring, as well as teaching. I was a certified substitute teacher for K-12th grade, I have taught 2nd and 4th graders for a year, and I am currently teaching the Bears’ Kindergarten class. When I am not at work, I find joy in singing, playing musical instruments, boating, swimming, and barbecuing. I also cherish time spent with my close friends and family. Surat Thani has been a fun, friendly, and welcoming place to live and work! I look forward to more time here! Hi! My name’s Emily and I’m the Kindergarten 2 Kangaroos teacher at Surat Thani International School! I first moved to Thailand in 2013 after finishing my degree in Criminology and Forensic Science at Northumbria University in Newcastle, UK! But I’m originally from a small town called Carlisle in North West England. I have lived in Thailand for around 5 years now! I previously worked at another school in Surat Thani but this is my second year at STIS! I love working and living in Thailand and I have had a very positive experience at my new job at STIS! My class is great, I have 18 students ranging from 4-6 years old. I always find it very gratifying teaching this age group as you can see them grow and learn so much over the course of the year. STIS is a great school to work at and there is always such a positive working environment here! I am definitely going to stay at this school next year because I have enjoyed working here so much! My name is Mitchell Rioux and I am proud to teach the Kindergarten 1 class at STIS, which is the currently the Dolphin class. I am from the cold country of Canada or more specifically its capital city of Ottawa. I received a bachelor’s degree from the University of Ottawa with a major in Psychology and a minor in Sociology before completing my TESOL certification and moving to Thailand. I came to Thailand a year ago to teach and have absolutely loved my time in this wonderful country. The people of Surat Thani are extremely friendly and welcoming. I also love living so close to the beautiful lakes and forests of Khao Sok National Park as well as the pristine beaches of Khanom and the many islands just off the coast. When I’m not travelling around Thailand, I love to play football, watch movies, listen to music, cuddle with my cat Carrot, eat delicious food, and teach at STIS! Hi! I’m Kelly, teacher for the starfish in K1. I am from Michigan in the United States, but have been making a home in different countries the past 3 years while teaching English. This is my third round with Kindergarten. I love to sing, dance, and be silly both in and outside the classroom. Luckily, teaching the little ones is enough exercise, so I can instead spend my free time reading, playing soccer, shopping at a 20 baht store, or browsing on Pinterest. I started in Suratthani 2 years ago at a different school and moved to Honduras last year, but I found myself missing the beautiful places and people of Thailand so much that it brought me back. Now, I’m here at STIS and loving it. The kids and staff alike are fun and awesome and make this school a truly rewarding place to teach! My name is Meredith Gallinger and I am the Curriculum Director at STIS. When I’m not helping the teachers, I am the main teacher for the Pre-K class, which is the Bumblebees this year. I also teach Math to Grade 2 and Science to Grade 5! I am from Ottawa, Canada and I received a Bachelor’s Degree from Carleton University where I majored in Canadian Studies. After receiving my TESOL certification, I moved to Surat Thani, Thailand a year ago to teach and I have thoroughly enjoyed my time here. I love to travel, draw, paint, hike, swim, play with my cat Carrot, watch movies, and listen to music. I am extremely passionate about STIS and am always striving to help make it the best school for teachers, students, and parents alike. I look forward to continuing my fantastic journey at STIS! Hello! My name is Jacob Janota. I am from the United States of America, more specifically central Florida. My education includes an Associates degree from Polk State College. As well as, a bachelors of science in logistics from Florida Polytechnic University. Shortly after graduating from college I moved to Surat Thani to become a teacher. I primarily teach the Koalas pre-kindergarten class. However, I also teach the 5th graders social studies and geography. If I’m not in the classroom you can find me in the gym leading basketball club. Or in the science lab overseeing maker’s spaces club for our students who have a desire to create new things out of recycled materials. My time at STIS has truly been a pleasure. I thoroughly enjoy spending time in the classroom teaching the students and challenging them to reach new heights. The small class sizes give me the ability to cater to each student’s needs. In addition to the wonderful students, the other teachers and staff are always extremely kind and helpful. 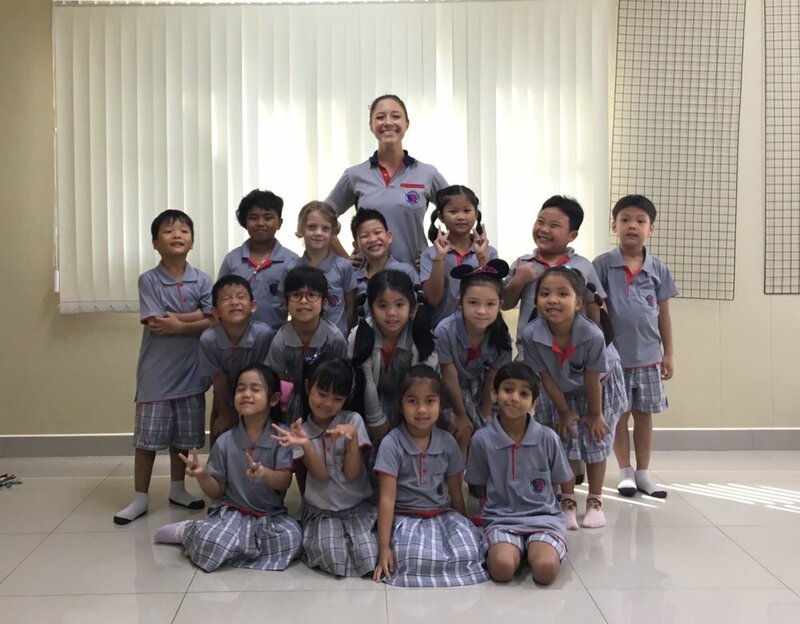 My name is Cati and I'm the K1 teacher here at Surat Thani International School! I'm originally from Wisconsin, but moved to Minnesota for college at the University of Minnesota in Minneapolis, where I studied Journalism and German. I stayed in Minneapolis until moving to Prague in 2010 to get my TEFL certificate. Since then, I have taught in the Czech Republic, South Korea, the United States, and Thailand. I lived in Chiang Mai for a year-and-a-half before moving to Surat Thani, and have really fallen in love with Thailand! It's a beautiful country with friendly people, great food, and amazing travel opportunities. This is my second year teaching at STIS. In my free time, I enjoy practicing yoga, writing, reading, and especially traveling around Thailand or SE Asia on holidays or three-day weekends! My name is Marcus Wykes, proudly the first British teacher at Surat Thani International School! I come from Newcastle Upon Tyne a small city in the North East of England. In 2014 I graduated from the University of Liverpool where I studied Economics and Geography. Not long after graduating from university I moved to Thailand to teach English as a foreign language. I taught in a rural school not too far from Surat where I taught up to 50 students at a time! I adore Thailand, it is such a remarkable place.There is so much to see and do here. I want to keep exploring the astonishing and memorable sights Thailand has to offer. My time teaching at STIS is approaching its first anniversary. I have been very fortunate to work with the majority of the classes here so have developed some great relationships with students of all ages. Currently I am known as "the math and science teacher" for the Zebras (Grade 2), the Orcas (Grade 3) and the Pandas (Grade 1). As well as this I am making good use of my Geography degree and teach Grade 2 and 3 Geography. So far my time in STIS has been so enjoyable and I can’t wait to continue on my journey as a teacher here. My name is Terrance also known as Mr. T, I have a Bachelor of Science degree with a major in Business Management. I was born in Minnesota and did four years of service in the U.S. Navy stationed in Beaufort, South Carolina and Jacksonville, Florida. I originally came to Thailand in March of 2012 to the capital city of Bangkok. It was a great experience with a blend of East meets West, amazing shopping and great food from all over the world and easy transportation with the Sky trains. Once I arrived in Thailand I did a TESOL program and jumped right into a classroom teaching college age young adults and doing some corporate teaching in the evenings. I eventually was offered a position working with children between the ages of one and a half years old up to three years of age. I loved it and had a great time with my role at that school. Eventually, being that I am from Minnesota, a state known for its beautiful nature, I grew a little tired of the big city living and was looking for a more natural and scenic living thus being how I ended up here in Surat Thani. 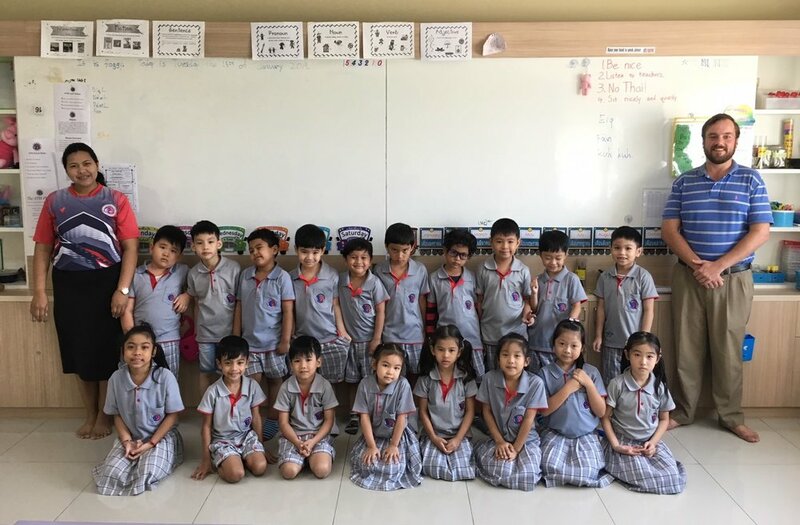 My name is Megan and I teach the K3 Penguins at the Surat Thani International School. I am from Central Florida but it’s always been a dream of mine to experience living in a different country. I love teaching so I figured, why not teach abroad! I got my Masters in Teaching English to Speakers of Other Languages and when I started looking for somewhere to go, Thailand seemed like a great place! It’s been an amazing experience. I love the kids in my class and I greatly enjoy teaching them! We have fun playing games and singing songs that go along with what we are learning. The teaching team here at STIS is also great. We work together and share resources to help everyone succeed. STIS is an awesome school to be a part of and Thailand is the perfect place to be! I’m Taylor! I teach the K2 class at STIS, which is currently the Hamster class. I’m from Michigan and I first moved to Thailand in 2010. I studied Thai language and culture in Chiang Mai. There I fell in love with the country, its customs, and its people. After earning a BA in Anthropology and Sociology and working in the United States for several years, I made my return to Thailand in 2014. I have been teaching in SuratThani ever since. I love my life here! I can sneak away to an island on the weekends or participate in one of the many teacher community events during the week. In addition, I have formed relationships here with people from all around the world. Everyday I continue to learn from and be inspired by them. This is my first year at STIS and I have really enjoyed my time here so far. I have an affectionate and energetic group of kids. It is extremely gratifying to see results from them and know how far they have come since the beginning of the year. I love working with my kids and the classroom we have created together!